A wagering requirement is a condition that an online casino attaches to your use of their promotions or signup bonuses. When you join an online casino for the first time, you’re usually eligible for a welcome bonus. For this example, let’s assume the bonus is $1,000 as a 100% match on your first 4 deposits of $250 each. On each of your first 4 deposits the casino gives you credit equal to what you deposit, up to a limit of $250 per deposit. But even though you can play with the money, you cannot withdraw it–not yet. To earn that bonus and to keep whatever remains of it and any possible winnings, you’re required to make a number of bets or wagers whose total cash value is a multiple of either the bonus ($250) or the deposit plus the bonus ($500). I’ll explain more below. That might seem like a lot of gambling. A good gambling site will offer you games with a reasonable theoretical return to player and low volatility.It’s your responsibility to recognize the games that are best suited for meeting wagering requirements. These are almost always slot machine games–even though there are some exceptions. You won’t lose every bet you place. It sounds like $12,500 is impossible to wager when you’re starting with $500, but on many of these bets, you’ll win some money. The house edge will whittle away at your bankroll slowly but surely, but it’s still possible to get lucky and have a winning streak when fulfilling your wagering requirements. Online casinos often attach other conditions to those promotions. You might have to fulfill your wagering requirement within 30 to 90 days after you receive each promotional credit. Some games will be ineligible. Also, online casinos often offer multiple welcome bonus promotions. You might see larger promotions for slot games and smaller promotions for table games. You have to apply the credit appropriately. At online casinos that allow you to accept multiple credits at the same time, you’ll see separate bonus balances in your account dashboard. The casinos’ software does the accounting math for you, and your wagers are deducted from the appropriate bonus accounts first. How Does Playthrough or Rollover Work? The “playthrough” (or “rollover”) is just a multiple of your initial deposit or credit or both. You have to gamble that much money before the casino agrees to let you keep some or all of the credit (if any remains) and your winnings. Many no deposit welcome bonus offers place a limit on how much of the credit plus winnings you can withdraw. Always be sure to print out a copy of the terms and conditions of the offers you accept so that you can refer back to them when you want to withdraw money. Once you have the money in your account, you transfer some of it to a game and start playing. Assume you’ve chosen a slot game that pays reasonably well, doesn’t offer big prizes, and for which you will gamble no more than $5 per spin. This is conservative betting, and it gives you a chance for hanging onto your money and even to play it up in substantial winnings. The average slot game player makes about 10 spins per minute. That allows for the occasional free spins or other type of bonus game. At $5 per spin, you’ll gamble about $50 per minute. That might seem like a lot of money, given you just deposited $250, but on a low volatility game paying relatively smaller prizes, you should win back most of that $50. Assume you have 80% of what you gambled at the end of each minute. That means you still have $40 out of that $50. And assume further that every 10 minutes, you win an average prize about of $100. If your playthrough or wagering requirement is 40 times (deposit plus bonus), you’ll have to make $20,000 in wagers to fulfill the rollover requirement on your first deposit. You’ll have to gamble for about 400 minutes (about 6 and 2/3 hours) to fulfill your obligation. You don’t have to do this all at once, though. You can (and probably should) stretch it out over several gaming sessions. You should also take a break at least once an hour. Get up and walk around, get a drink, relax, stretch, etc. If you’re losing $10 per minute, and you only have $500 to gamble with, you’ll run out of money in about 50 minutes. But you should win some nice prizes across 500 spins. The theoretical return to player rating per game (if you can find it) helps you to visualize what you might win back. In fact, it’s possible to be ahead within a few minutes of starting a game. But I’m assuming you’ll win an average “big” prize of about $100 (20 to 1 odds on a $5 bet) every 10 minutes or so, which means you’ll get back back about $500 after 50 minutes of play. In other words, there’s a chance that with conservative betting you’ll have more than your initial $500 deposit plus bonus credit at the end of your first 50 minutes of play. This doesn’t always happen, but most people can stay in the game at least that long. Slot games and a few other games are usually given full playthrough credit. In other words, for every dollar you bet on these games your wagering requirement is reduced by one dollar. But table games like blackjack and roulette may award you with less credit. You might be credited only 40 cents or 10 cents per dollar wagered on these kinds of games, and that is why we recommend you stick with the slots. Also, some casinos require that you only play slots to earn their bonus credits. There are several types of welcome bonus promotions, too. Some online casinos offer you a “table games bonus,” which may be less than the “slot games bonus” and have a less overwhelming rollover requirement. If you enjoy playing poker, and if your casino offers poker, it might only provide relatively modest credits of $100 to $250 to poker players. The wagering requirements on poker welcome bonuses are adjusted to this game’s style of play. How to Beat Wagering Requirements? The wagering requirements are there to make sure you can’t take advantage of the casino and walk away with free money. Think about it. Without any kind of rollover requirement, you could deposit $250, claim a $250 bonus, place a single $5 bet, lose, and then withdraw $495. It wouldn’t take long for these online gambling sites to go out of business that way. But when you combine a requirement for a certain amount of action before allowing a withdrawal, the casino gives the house edge a chance to whittle away your bankroll. Most of the time, the playthrough requirements are set up in such a way that the probability of walking away a winner is minimal. You sign up, deposit $250, get a $250 deposit bonus, and decide to play slots with your $500 at $5/spin. Most online slot machines have a better payback percentage than brick and mortar slots, but you can assume the house edge is probably still at least 6%. If you’re required to make bets equal to 25X your deposit plus bonus, you’re looking at $12,500 in action. If the house edge holds true, your expected loss on that much action is 6% X $12,500, or $750. That’s $250 more than your bankroll. Of course, that’s a long term expectation, so in the short run, you might do a lot better than that. But how do you increase your chances of beating the long term expectation? How do you beat the wagering requirements and walk away a winner? The first thing you need to understand is the difference between the short term and the long run. In the short term, anything can happen. In fact, it’s next to impossible to see results similar to the mathematical expectation in the short term. Think about it this way. The ultimate version of the short run is a single bet. If you bet $100 on a single spin of a slot machine game, you’re not likely to lose $6 and get $94 back, even if the house edge is 6%. That expected loss is an average over time. So your best chance of seeing a result different from the average over time is to place fewer bets and hope to get lucky. If you want to beat the wagering requirements, you should make as few big bets as you possibly can. You’ll still probably lose, because the odds are against you. But when you win, you’ll hit a larger prize amount. Once you’re far enough ahead, you can revert to a smaller bet size and make larger bets in an effort to preserve your winnings. I had $500 in my account, and I needed to place $12,500 in wagers before cashing out. I bet $25 on a slot machine game, and on the 3rd spin, I won $6000. At this point, I had $6425 in my account. Now my goal is to get my $12,500 in wagers in while losing as little as possible. 6% of $12,500 is $750. If I can get close to that, I’ll have $6425 – $750, or $5675 left. The best way to improve my chances of just losing $750 is to place as many small bets as possible. And that’s what I did. I cashed out with over $4000. I used the money to buy a jukebox, in fact. That’s how you beat the wagering requirements–you place big bets and hope to get lucky early. This also requires accepting the fact that you might go broke early. That’s okay. If you go broke early, you can just switch to the free games. Your goal isn’t to maximize the amount of time you’re playing on the machines. It’s to maximize the amount of money you might win. Why Won’t The Casino Let Me Withdraw My Money? Early withdrawals usually void the welcome bonus offer. Players sometimes become upset with the online casinos when they won’t allow early withdrawal. Good gambling sites always warn you if you are about to void their offers with a withdrawal. Some gambling sites might automatically deduct your bonus credit when you make the withdrawal, which could wipe out the withdrawal amount. You don’t want to do that. Getting angry with the casino won’t help you, either. You agreed to play by their rules when you accepted the bonus offer. But other conditions may apply, too. Say you have fulfilled the wagering requirement, and you came out ahead. On your initial $500 deposit plus bonus you won $2000. You want to withdraw that $2000, but the casino cashier says the amount is too high. Some casinos have a daily withdrawal limit. Check the terms and conditions to learn how much you can withdraw per day. Some casinos allow you to make deposits with credit cards but require that you withdraw to some other account, too. Some casinos are now offering Bitcoin deposits and withdrawals, too. You’ll have to set up your own Bitcoin wallets and find exchanges where you can buy and sell the Bitcoins on the open market. The casinos don’t help much with any of that. Casinos place these limits to manage cash flow. Sure, there may be an incentive for you to stay around and keep playing their games if it takes a long time for you to get your money. But the typical casino has to be careful that players don’t load up on it and demand all their money at once. That would be like depositors making a run on their local bank. The bank’s (and casinos) cash reserves could be quickly depleted, leaving some depositors without any way of withdrawing their money. And don’t forget that online casinos have employees and expenses. They have to pay their bills just like everyone else. 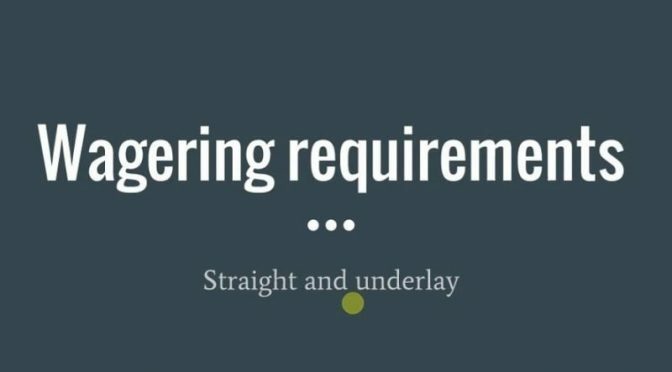 “Wagering requirements,” “playthrough requirements,” and “rollover requirements” are 3 different phrases describing the same thing: How much you’re required to bet before making a withdrawal from an online casino. These wagering requirements are usually attached to your redemption of a signup bonus or other promotion. Most online casinos only count wagering on slot machines toward the fulfillment of these requirements. But some casinos count wagering on other games, especially table games with a low house edge, at a discounted rate toward the fulfillment of those wagering requirements. How Reliable Are Online Casino Reviews?